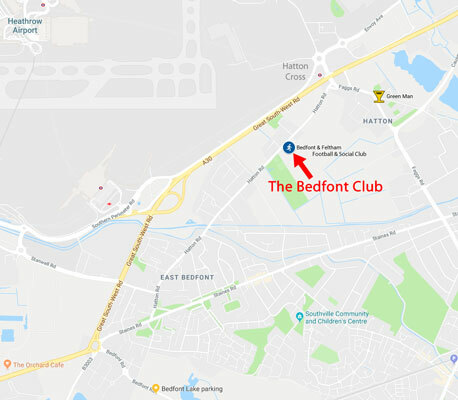 The Club meets at the “Bedfont & Feltham Football & Social Club” in Hatton Road near Hatton Cross Underground Station. The club is on the east side of Hatton Road and the entrance to its large car park is opposite the Duke of Wellington pub. The postcode is TW14 9QT. Further down Hatton Road on the same side is the "Bedfont Sports Club". We don't meet there!